Huawei is among the top-selling manufacturers for a very simple reason - the company has a device for every price segment. 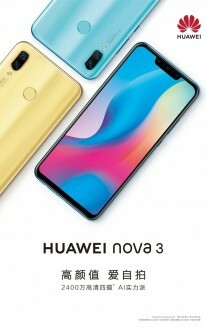 After the unveiling of Huawei P20 and Huawei P20 Lite, now it is time for the Huawei nova 3 series that are offering a middle ground between the two P20 devices. 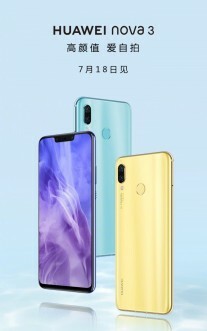 According to a post on Weibo, the new phone will be unveiled on July 18 in Shenzhen with dual AI cameras and a notched screen, as previously expected. It could launch in the Philippines 10 days later. 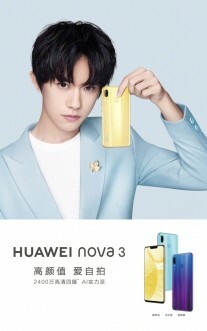 The Huawei nova 3 looks like the Huawei P20 Lite but will have different specs, per TENAA. The chipset will have octa-core CPU at 2.3 GHz, which is what the Kirin 659 runs, although there are rumors about a Kirin 710 SoC. RAM is expected to be 6 GB, while storage is either 64 or 128 GB. The screen will have a 6.3” LCD panel with a Full HD+ resolution in 19:9 ratio. The AI dual camera on the back looks intriguing - 16 MP + 24 MP, similar to the Honor 10 setup with a Monochrome sensor. There are two cameras on the front as well - 24 MP + 2 MP for artificial background blur. The battery of the Huawei nova 3 will be 3,650 mAh and likely will have Super Charge technology that tops up half the battery in 30 minutes. The phone will be available in at least three colors - Blue, Aqua, and Yellow. Huawei's another super beast phone after P20 Series!.. cheers!